In the aftermath of the cold war, political commentators spoke ebulliently of the triumph of liberal democracy over its ideological rivals. Shortly thereafter, however, a surge of ethnic and religious violence raised doubts about whether democracy could survive outside Western culture. Similar concerns were soon raised even in Western nations by widespread citizen disengagement from the political process. Voter apathy, ideological conflict, and debates about cultural diversity intensified doubts about the continuing viability of democratic institutions. Throughout the whole world, then, few questions have come to define more clearly the challenge of our age than this: how to facilitate civil, free, and democratic interaction among citizens of multicultural societies.Democratic Civilityexamines the core requirements necessary to make democracy work. Subtly interweaving case studies and theoretical reflection, Hefner and his contributors examine the ideals, culture, development, and organization of civil democracy. Against a historical background, they consider today's challenges to democracy, asking whether international politics is destined to lead to a clash of civilizations, or whether civil and democratic ideas are indeed realizable in a multicultural world. Essays by Adam B. Seligman, Robert Wuthnow, Brigitte Berger, and Anton C. Zijderveld address subjects germane to the 'culture wars' controversy in the United States and other Western countries. And Daniel Chirot, Jose Casanova, Robert P. Weller, and S. Gordon Redding examine the prospects for democracy in non-Western, post-communist societies, in particular Chinese society and the Muslim world.Hefner's highly readable volume reaches the core of the ongoing debate between Samuel Huntington's The Clash of Civilizations and Francis Fukuyama's The End of History - whether liberal democratic values are generalizable to non-Western societies, or realizable only in the West. 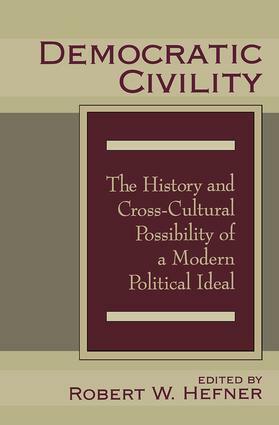 Democratic Civility will be of interest to those in the fields of anthropology, sociology, history, political theory, and philosophy.